Salgaocar will now face Sporting Clube de Goa in the final on Saturday at 6:30 pm. Salgaocar believed they would win in regulation time, only for Ghanaian striker Enock Cudjoe to score the equaliser in the 84th minute. As the score was 1-1 in regulation time, the result was decided via tie-breaker. fumbled after Harkirat Singh had converted the first spot-kick. Salgaocar goalkeeper Jaison D’Mello made two consecutive saves to stop the attempts of F Lalwuanpuia and Nitesh Monda to give Salgaocar the win. be overawed with the opposition who had two foreign players in their ranks and had won all three of their matches in the group stage. Salgaocar finally broke the deadlock in the 58th minute when Sanson Pereira’s free-kick saw the keeper fumble and Devendra pounced on the opportunity. 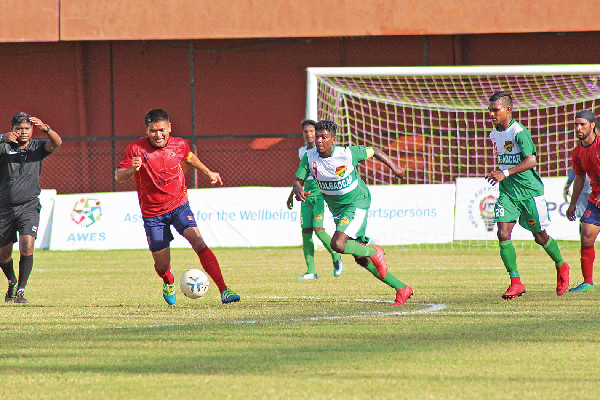 followed, Salgaocar kept their cool and sealed their place in the final.